To remove the stress and improve mechanical properties of drop forging, heat treatment will be done after forging. Such heat treatment can be normalization, tempering, quenching, temperting & hardening, ect. To test the heat treatment result, we may test the tensile strength, yield stength, enlongation, hardness, among these mechanical properties, hardness test is usually used for drop forging. Today, we will introduce common hardness testing methods for closed die drop forging. Brinell hardness measurement principle is to use a certain test force F (N),pressing quenching steel ball or cemented carbide balls with diameter D (mm) into the surface of drop forging, unloading test force after the prescribed time, with a reading microscope to measure indentation average diameter D (mm), and then, calculate out the brinell hardness value according to the formula or find out the brinell hardness value in line with D from has been prepared brinell hardness scale. 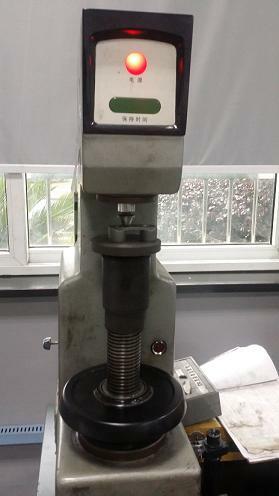 Rockwell hardness test is used when the drop forging sample is too small, or being measured brinell hardness (HB) of drop forging is more than 450, is to switch to rockwell hardness measurement. Test method is to use a diamond cone with 120 degree apex angle or steel ball with diameter 1.59mm/3.18mm, pressing into the surface of drop forging products under certain load, and test out the rockwell hardness by indentation depth. Both briness hardness and rockwell hardness are all the testing standard for drop forging hardness. Although the testing methods of them are not the same. But either of them can be adapted to see the hardness result of drop forging products. To ensure correct testing result,for one drop forging product, we should testing the hardness in different sections and check if heat treatment of drop forging is done in a good way.